This is the third part of a series on The Synthetic Aesthetic: artwork which is mechanically made as opposed to handmade ( Part 1 / Part 2 ). 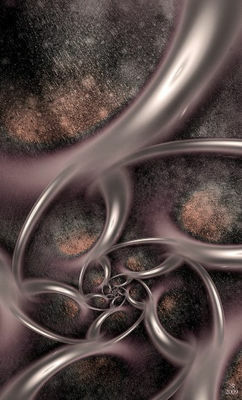 Fractal art borders on this synthetic realm because it is one of the most powerful tools for the computational generation of imagery. Most people commonly think of fractal art as the visualization of math or of at least having a unique character because of its inner workings that draw on the principles of fractal geometry. However, I think fractal programs have for years been used primarily to synthesize artwork of a much more general nature and the connection with fractal math is an exaggeration. If someone can make the same kind of fractal art in Photoshop as one does in Ultra Fractal but without the use of fractal algorithms, then surely the fractal link in much of fractal art these days is truly weak. This doesn’t mean fractal art is no good anymore. All of the fractal artworks I’m going to review here and compare have been selected by others for their artistic merit. My point is that fractal programs are capable of producing highly distinctive works exemplifying the graphical creativity of fractal geometry, but also of producing things that are much less distinctive and best regarded as just digital art made in a fractal program. That “digital art made in a fractal program” is an example of the synthesizing capabilities of fractal programs. Fractal artists these days chose to pursue the more wide-ranging, synthetic themes than the classical fractal shapes and structures of the past. While doing so, however, they blurred the distinction between Ultra Fractal and Photoshop, which I think you will see in the images below. I have used fractal images that were chosen for the Benoit Mandelbrot Fractal Art Exhibits (winners) since I wanted to used fractal art that was representative of a consensus of opinions and therefore exemplary of fractal art today. I could have chosen eccentric examples from unknown artists but they could easily be shrugged off as not representative of anything except themselves. Mark had an image similar to the one above included in one of the exhibits and this one here is from the front page of his online gallery site; clearly a favourite of his. 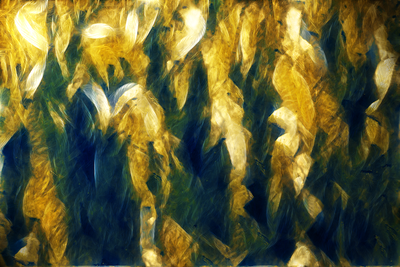 Here’s a new abstract piece that was done using a wacom tablet and some filters. You can’t really appreciate the detail with this size but you can tell it has a lot going on. Whether one is better than the other is not what these comparisons are about. The style of imagery is essentially the same and yet they were made in two very different programs. One using fractal algorithms and the other a stylus and Photoshop. Granted, Mark’s image doesn’t depict complex fractal structures that would be difficult to duplicate with non-fractal methods and so it’s not really an example of Ultra Fractal vs. Photoshop for making fractals. But that’s the whole point that much of fractal art today isn’t reliant on the complex drawing powers of formulas but rather the creative possibilities of rich rendering methods and the careful selection of zoomed-in areas. I created this in Photoshop as a texture for my ‘Abstract Ornamental’ piece. In Cinema 4D, I created a new vray texture and selected the ‘Diffuse Layer 1’. Loaded the image as the texture map and set it to 100%. Then all I did was check ‘Specular Layer 5’ and left it at default. Sandra’s image, another BMFAC winner, is perhaps too good of an example of the minimal role that fractals have in today’s fractal art scene. 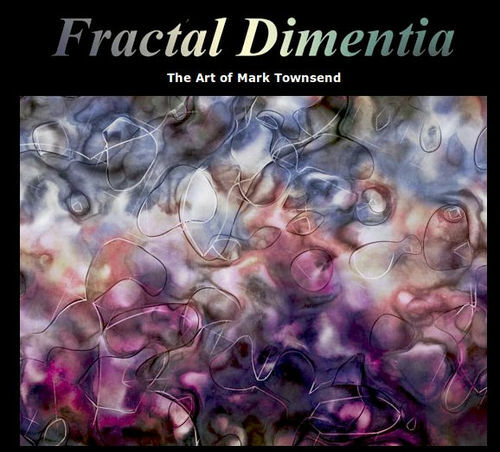 Although the title fits the work nicely and perhaps is an allusion to the fusing of classic fractal imagery with the newer, general synthetic variety (i.e. detailed background), it could almost be considered a “token” element. 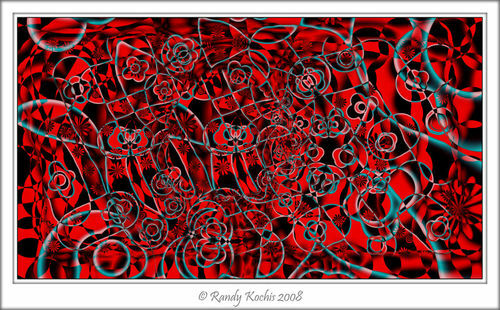 Take a look at Randy’s “non-fractal” spiralling mass, and ask which one would be easier to make with tablet in Photoshop. I had fun making this image with a Wacom tablet and a cool brush in Photoshop. Mostly playing around but I think it turned out pretty good. The original image is huge and the detail is amazing! Note, once again, the allusion to amazing detail. 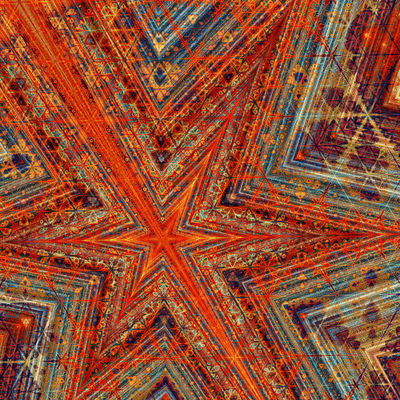 That’s the sort of thing one expects from fractal imagery because the formulas are so good at calculating such things, but it appears to be characteristic of many kinds of computer graphics. I hope Maulana will forgive me for this, but I’m not suggesting her his work is nothing more than a few splotches from a “brush” in PS. This was made in a fractal flame program like maybe Apophysis (I’m guessing) but even flame fractals don’t look like they used to. Anyhow, my point (I hope it’s not too sharp) is that PS also makes such examples of rich jewelled and metallic looking wonders. 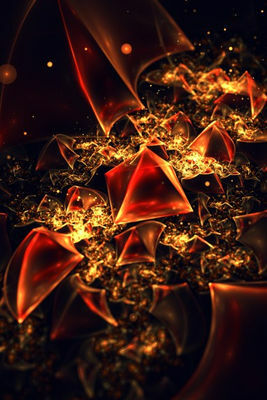 Clearly fractal art, even in the flames area, is just one way of rendering such artwork. 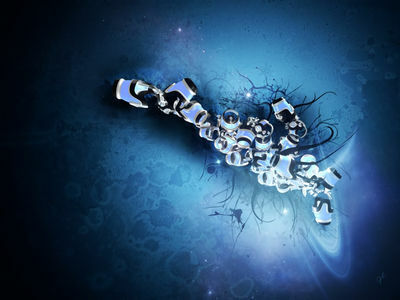 There are no notes for the image below; it’s simply the sample image from a PS tutorial. By the way, check out the nicely textured background. Importing backgrounds are a snap in UF. I’m guessing they are because they’re used so often. Alright. Remember the point of this posting is that many fractal artworks have moved into less distinctive territory and because of this one often finds similar artworks that are not the result of fractal formula rendering. Sam’s work above was part of a BMFAC exhibition in the judge’s category. While it has detail that would be pretty hard to imitate in PS, it also has an aesthetic that is much less exclusive. 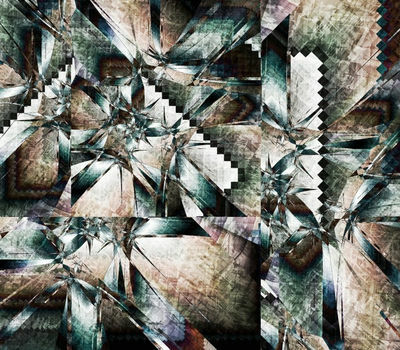 Geometric assemblages and patterns are an example of what I would call the fractal aesthetic, a fractal style of imagery associated with fractal programs and not strictly fractal math itself. 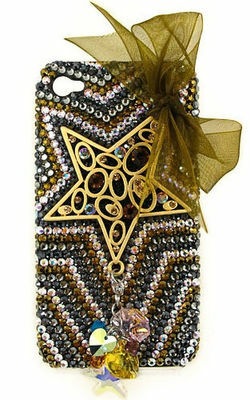 This cellphone case wasn’t made in PS obviously but being made of sequins and metalic shapes, the star shape being most prominent, it does reflect the same style –but different source idea– that I’ve been talking about. Sam’s image is of course a much more sophisticated and elegant work of art than the cellphone case below, but the two objects have an awful lot in common in a basic, visual sense although they are not of the same quality of work, clearly. I hope at the very least you’re seeing a glimmer of my idea that many highly esteemed fractal artworks aren’t really all that unique when compared with some of the things that can be made without any fractal formulas in Photoshop or even crafting class. But we shouldn’t really expect such exclusivity when we consider how wide-ranging the rendering capabilities of a program like Ultra Fractal is, and has become, and especially when we take into account its non-fractal features like image importing and various layering abilities. You can’t expect the same old stuff when you’re using software like that. 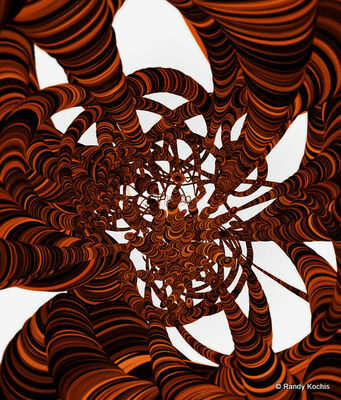 Fractal art by default has come to be defined by whatever you can make in a fractal program. As a result, when fractal programs add rendering and processing features this literally redefines the genre. The result is that fractal artists have greater latitude in what they can depict in their artwork and they’ve naturally drifted away from the cliche and common, classical style of fractal imagery towards fresh horizons. But is that still “fractal enough” for those who look to fractal art for the depiction of more obvious mathematical themes? I can’t help but wonder if the ICM, the original sponsors of the BMFAC have no fractal art exhibition listed on their 2014 website because they no longer see this fractal art stuff as having any serious mathematical connection? Is it all too much of something else? Synthetic is what I think that “something else” is and it’s been there ever since the computer rendering of fractals began. Fractal artists have turned their eyes from capturing visualized math to beholding bold new graphical concoctions. And in the next instalment, Part 4, I’ll have something more definite and clear to say about that. well of course i forgive you..